The Storymoja Hay Festival is 7 Days Away..they’re moving very fast, Speeding I tell you…. It’s been an exciting journey on my end. Going through the program, working with the other interns as we prepare to be part of the festival. We now have our jobs and know what our roles will be during the festival. We’re excited to meet you at the festival, and help you out, as you experience the Storymoja Hay Festival. If you’re coming, and have your ticket, Great! Count the days! What is a Storymoja Hay Festival Masterclass? Masterclasses are wonderful for people interested in a particular industry. People who want to learn more about writing both fiction and non-fiction. There are blogging masterclasses. There are topics on film, poetry and art, even entrepreneurship. Expect to see Vuyelwa Maluleke, Chief Nyamweya, Alexander Nderitu, Mathew Shenoda, Dilman Dila, Prajwal Parajuly, Tony Mochama, Jackson Biko, Dizraeli & L-ness and so many more…. It is scheduled on Wednesday 17th from 2.30 pm to 5.30 pm. If you’re interested in drawing comics or even reading them, sign up for the class and spend these three hours having a conversation with Chief Nyamweya who is a talented and creative illustrator, you’ve read his work, Roba published by The Star newspaper, if not go check it out! You get to ask him questions about his work, the industry, and any other burning questions you might have. He too will ask you questions. You’re welcome to having a lively discussion in this space. If you want to be an illustrator, this is the perfect opportunity for you to learn more about what it takes. Sign UP Here for this particular Masterclass. Visit this Link for More Masterclasses. Sign UP now so you don’t miss a Spot. You don’t want to miss a Discussion with your favorite Writer, Poet, Filmmaker, Journalist, Artist, Musician….so many are coming. We’ll have loads of students coming to the Festival and experiencing the different sessions prepared just for them. There will be stories and songs at the Koko Riko Tent, Dance with Poetry at the Kanga Tent. 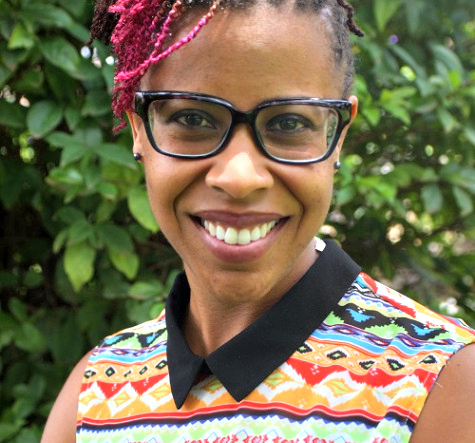 The Kanga Tent will have Joanne Ball-Burgess from Bermuda. She’s an accomplished Dancer and a Sakata Dance Competition Judge. Don’t miss out on this! There are Spoken Word sessions with Dizraeli (UK) and L-ness (Kenya) Find the Careerpedia Tent where students get Tips from Successful Entreprenuers like Rose Maket from Alive & Kicking and Ritesh Doshi (Naked Pizza). There are so many guests, I can’t name them all, you just have to make it to the festival. Parents, get your kids to this three-day Program if possible. The festival is hosting over 2,000 students. Don’t be left out!! Cost: Kshs. 1,000 at the GATE. WEEKEND Events include The Launch of Diaper Mentality Exhibition and an Exhibition of Our Nairobi: A Westgate Memorial. Enter the Dome for a Wangari Maathai Memorial Lecture with Professor Wole Soyinka (Nigeria). Explore the Program Schedule, it’s packed with amazing events that will leave you excited, inspired, and wanting to change the world! Both on Saturday and Sunday! I hope that is enough to convince you to come……What? After 7 PM on Saturday, it’s time to Party!!! Saturday Night, One Time Performance…. 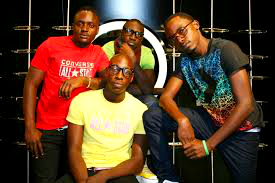 One Stage you get SAUTI SOL(Kenya) , DIZRAELI (UK) AND BERRY HEART (Botswana)!! Sorry, I was just imagining @Sauti Sol on stage, singing…Dizraeli…getting down on stage…And Berry Heart…giving a heart stopping performance…yeah, no sleep required on Saturday!!.. The ticket for this Event is separate from your Entrance Fee! Yeah, I know….but you can just buy the ticket for this which is Kshs. 1,000. Show up at 7 pm, and experience the concert. (If you do this, we’ll miss you during the day….^_^) So, we hope you get both the day’s ticket and the Concert Ticket. Support Start-a-Library. I really hope to see you guys at the Festival. We’re counting down the days now. I’m excited, nervous…excited…what about you? Hey, go get a ticket so we meet there okay. Ticketsasa.com/ Storymoja Hay Festival. You don’t want to be left out of this!! Now for the Blog Giveaway!! I have the hook-up for one lucky person! Only one! It’s a FREE TICKET – SATURDAY EVENTS FROM 9am to 7 pm. 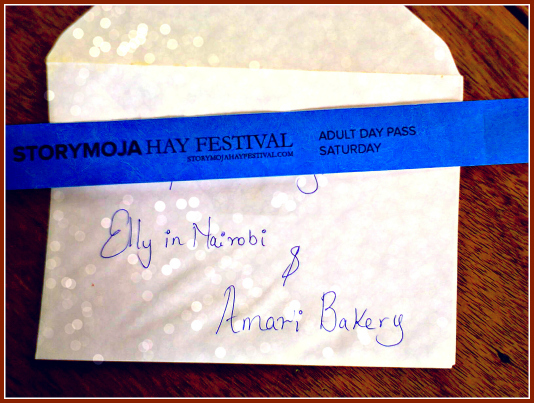 This blog is collaborating with a fabulous Online Bakery named Amari Bakery to sponsor one (1)person for the Storymoja Hay Festival Saturday Events. Time: 9 am to 6 pm. 1. What Type of Oven does Amari Bakery use? 2. Tell us Why You REALLY, REALLY Want to go to the Storymoja Hay Festival. Impress us with your answer! Amari Bakery and I will choose the winner and Make an Announcement by Friday September 12th, 2014. Don’t worry, the winner will get their ticket delivered personally by me or the Amari Bakery Rep. Here’s a picture of the Ticket! Thank you for the response, will announce winner on Friday. Great answer.